Indigenization. (I want to focus on three ideas indigenization brings to my mind) Our greatest knowledge is from our traditional teachings and values, it’s a way of life that’s been refined by our ancestors over thousands of years which has guided us to survive and flourish in world that was meant to erase us. Community is a powerful gift that we as indigenous people are very knowledgeable of and careful with. We create a strong bond with each other in my tribe by recognizing your opposites at each opportunity. By doing so, it creates the respect we need to keep moving in love and strength. Knowledge is a powerful asset, as Tlingits we teach our children how to treat each other, how to recognize who each other are and where they’re from, hold each other up in ceremony, caring for the land, caring for our bodies, our understanding of the world is what heals us helps us grow. I am a tlingit artist, I was involved in my culture as long as I can remember, growing up singing, dancing, attending ku.éex’ (ceremonies). Over the last two years i’ve been learning traditional tlingit arts such as jewelry engraving, wood carving, drawing, and digital art. 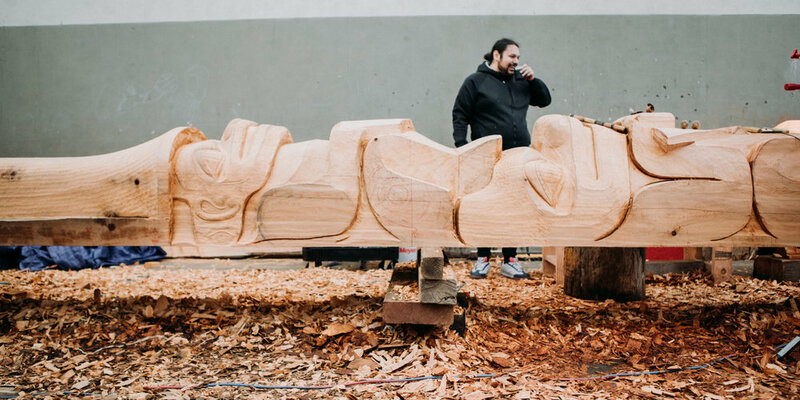 I was hired last year to create a totem pole in remembrance and honor of a tlingit village that was burned down in 1962, it was intentionally burned by the city in order to make a boat dock. The totem pole I carved with many talented carvers is a monument to healing and reclamation. I heal by spending time with my family, elders, and friends engaged in social justice and healing. I have been focused on educating myself about indigenous histories, concepts, creating designs, carving traditional objects, conceptualizing art pieces with my partner. My art, carving, other’s art, others carving, dancing in ceremony, singing my clan songs, learning to speak my language… I just find that healing happens in so many ways it’s hard to narrow down, but at the moment this is the way i’ve been healing. I am working towards healing myself, my family, my friends, and my community. My community is anyone who respects the responsibility we have to each other by lifting each other up and creating a healthy space for humanity, but indigenous people especially. Yes. My ancestors taught the mentors who taught my mentors, they taught the mothers and aunties who taught my grandmas, I learned from a long old knowledge that’s survived thousands of years, which was passed through my uncles aunties and mom. They’re the only reason I live. I do my best to continue their teachings through sharing my knowledge, and picking up more of the ways they left behind for us. I look up to anyone striving to indigenize communities in a good way. I also look up to elders that have insight to the world, and how to work with each other. Keeping Tlingit culture alive. To be a resource of indigenized knowledge and values that generations after me can learn and grow from, while I continue to understand the world around me in a tlingit lens I realize that the knowledge my people held for the last +15,000 years is irreplaceable therefore it is my responsibility to learn as much as I can to be able to share it with everyone and in doing so continue the knowledge for another 15,000 years. Yee gu.aa yáx̲ xʼwán, it means “have courage!” in Tlingit. I want you to know and hold your space. You’re indigenous queens and kings that belong to millenniums of ancestors who specifically made a culture and place for you. I want you to know that you all belong here, and your abilities has no limits. We’ve not only survived in this world, but we thrived in this world. We are the future that brought indigenous people back from the edge of existence with an explosion of wisdom resiliency and power that our ancestors left for us!